In 1997 when “Big Men Cry” was originally released on Planet Dog Records, no one could have predicted the chaos that would surround and follow it. The campaign was a classic case of the record company marketing one thing and the artist recording another. In this instance, the label and many of the public alike wanted “another Last Train to Lhasa” but for Toby Marks (AKA Banco de Gaia), another “Lhasa” was the last thing on his mind. Add to that a breakdown of relations between Toby and the record label and you have all the necessary components for a pretty uncomfortable album release. This was compounded by Ultimate Records, who licensed the Planet Dog label, going into liquidation shortly after the album’s release. As a result “Big Men Cry” never really got the attention it deserved and didn’t come close to the chart success of “Lhasa” or “Maya”. This sorry state of affairs was little to do with the musical content: the reviews in the press were good (see below); the opening track “Drippy” was used to great effect in Darren Aronofsky's film “Pi” and Rabbit in the Moon’s remix of “Drunk as a Monk” became a cult American rave anthem, championed by DJs like Adam Freeland and Dave Seaman. All of this meant that “Big Men Cry” became the ‘lost’ Banco de Gaia album, a situation this 20th Anniversary edition so justly rectifies. The reissue comes with a bonus disc which features previously unreleased alternative versions, classic remixes by Rabbit in the Moon, Temple of Sound and Future Loop Foundation, new remixes by Toby, longtime collaborator 100th Monkey (Andy Guthrie), and sound artist Digidub plus a live version of ‘Celestine’, recorded in Banco’s ‘local’, The Bruton Dub Club, by his three piece band. 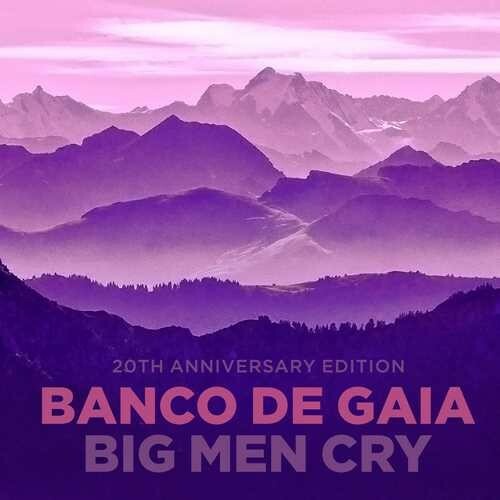 As with the previous 20th Anniversary reissues of Banco albums, “Big Men Cry” will only be available in limited edition CD format, with no downloads or streams available.